NOTIFICATION: M.P. 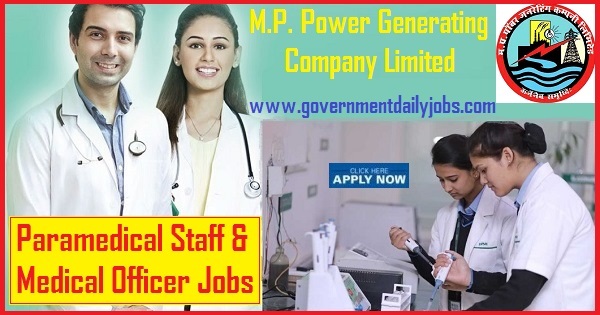 Power Generating Company Limited (MPPGCL), Jabalpur inviting online applications for filling up 42 vacant posts of Paramedical Staff and Medical Officer (MO) from eligible and interested willing candidates. It is latest & good information for unemployed personnel those who are looking for these new Jobs in Government sector & other organizations. Job seekers, who wish to apply for these vacancies regarding MPGCL Recruitment 2019, must have passed 12th Class and Diploma/Degree in relevant Trade/MBBS with a required experience if asked. Applicant’s upper age should be as per Govt. rules and age relaxation is applicable to all reserved category candidates i.e.SC/ST/OBC /PWH /Ex Servicemen /Women candidates etc. PLACE OF POSTING: Madhya Pradesh. NO OF VACANCIES: 42 vacant posts of Paramedical Staff and Medical Officer (MO) in M.P. Power Generating Company Limited (MPPGCL), Jabalpur. 1. Paramedical Staff – 28 Posts. • Laboratory Technician: 02 posts. • ECG Technician: 03 posts. • Staff Nurse: 12 posts. 1. Paramedical Staff: A passed of 12th examination from any recognized Board and should have a Diploma and Degree in the relevant subject from any recognized Institution. 2. Medical Officer: A passed of MBBS Degree of any recognized by MCI; Candidate must have permanent registration with MP Medical Council Bhopal. 1. Medical Officer – 21 to 40 years. 2. Paramedical Staff – 18 to 25 years. GK on General Awareness question and answers, Candidates who are willing to join any Government jobs may download this General Awareness questions and answers which are asked in previous competitive exams. 1. Medical Officer Rs. 56,100- 1,77,500/- pm. 2. Pharmacist: Rs. 19,500- 62,000/-. 3. Laboratory Technician: Rs. 25,300- 80,500/-. 4. Radiographer: Rs. 25,300- 80,500/-. 5. ECG Technician: Rs. 25,300- 80,500/-. 6. Staff Nurse: Rs. 22,100- 70,000/-. 7. ANM: Rs. 19,500- 62,000/-. 8. Dresar: Rs. 18,000- 56,900/-. REQUIRED APPLICATION FEE: For said vacancy a non- refundable application fee is to be paid by the candidates as per rules. An amount of Rs. 1000/-+ Rs. 118/- as portal charge by General & OBC candidates of MP domicile & candidates of all categories belonging to other states and Rs. 800/-+ Rs. 118/- as portal charge (Rs. 600/- for Paramedical staff posts) by SC/ ST/ PWD candidates of MP domicile to be paid in cash at MP Online kiosk. One time edit facility will be available before the last date of submission of application. SELECTION PROCESS: Applicants who are screened for applicability/ eligibility are being selected as per organization policy/rules depending on the basis of their performance in interview (written test for Paramedical staff) and document verification. ONLINE TEST CENTRES: The online written test will be conducted in four cities of MP i.e. Bhopal, Jabalpur, Indore & Gwalior. रेलवे नियुक्ति संस्था/रेलवे रिक्रूटमेंट बोर्ड (RRB) ने Group D 103769 पदों पर विभिन्न Assistants in various trades and Track Maintainer पदों, Advt No: RRC 01/2019 के लिए नोटिफिकेशन जारी किया है, इच्छुक उम्मीदवार यहाँ आवेदन कर सकते हैं। आवेदन करने से पहले पूर्ण अधिसूचना यहाँ पढ़ें । 103769 Group D vacant posts of Assistants in various trades and Track Maintainer Grade IV in Level 1 of 7th CPC Pay Matrix in Indian Railway, Recruitment Board (RRB), Headquarters Office, New Delhi. LAST DATE TO APPLY: 26-04-2019. HOW TO APPLY: For said posts (MPPGCL, Jabalpur Job Opening for 42 Posts of Paramedical Staff and Medical Officer (MO) Job) eligible, willing and interested candidates may apply through online at official website up to last extended date. Applicants must retain a hard copy for future reference. 6. Complete the MPPGCL application form with the essential data. 8. Take a print out of MPPGCL Recruitment 2019 online application form for future reference. CONTACT ADDRESS: M.P. Power Generating Company Limited, Block No. 9, Shakti Bhavan, Vidyut Nagar, Rampur - Jabalpur- 482008, Madhy Pradesh. CONCLUSION: M.P. Power Generating Company Limited (MPGCL), Jabalpur invites online application for the recruitment of 42 vacant posts of Paramedical Staff and Medical Officer (MO) on regular basis from Indian residents who are eligible & interested; candidates can apply through online. LAST DATE TO APPLY: 14-04-2019 for MPPGCL Recruitment 2019 for 42 Paramedical Staff & Medical Officer Posts.